It’s been surprisingly cold in Tucson for the last week. Their temperatures have been close to what we have in Poznan. The big difference is that they’re not ready for it. Double pane windows are not the norm, and since you can usually get through the winter with just a heavy sweater, people aren’t used to bundling up. 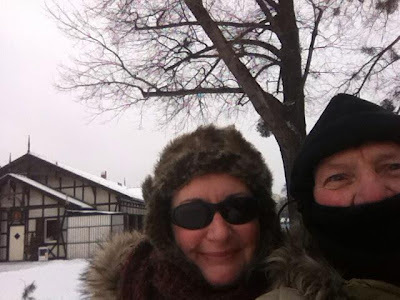 With temps around 20F, we’re still getting out for walks. We walked from our place to Zamek recently and cut through the Chopin park that we observed from the tram a hundred times. It’s was created by the Jesuit College in the 1700s. It was originally a botanical garden, useful in biology lectures. The garden later became part of a residence, and in 1938 it was opened to the public as a park. This walk was to the lake for coffee, to what we will always refer to as Caroline’s and my coffee shop, with a stop at the mall for groceries on the way home. Our coffee shop, at the west end of Lake Malta, could also be described as a biker bar. It’s home to the Mother Chapter of Moto Magneto, a Polish motorcycle club, complete with a Confederate flag in the window. Many Americans are offended by graffiti, but during the past ten years sometime in my going back and forth to Poland, I stumbled onto the fact it's seen differently in Europe. It's regarded as "poor man's art," or at least that's what a PBS program taught me. Lori – Good point. We've noticed in Germany that sometimes they save a wall of grafitti when they bring a building down, famous grafitti artist, I guess. Not grafitti but, I noticed on the monument for Polish Cryptanalysts..my maiden name–Rajewski, except spelled with an E instead of an A!!! COOL! Great pics! And Brrrrrr in AZ—I plan to visit there the end of Feb. but, being from MI just means taking the clothes I've been used to this time of year and throw in a tee shirt…just in case! Oh, by the way, Lori, we are taking the Amtrak train from MI to AZ…..lots of fun! So now I'm going to watch for grafitti on the trains!!!! Marilyn…….My great grandmother's maiden name was Rajewska. Do you have relatives in Poland where I live? Marilyn – the cold is a real fluke in AZ and never lasts long. I'm sure you'll have wonderful weather and lots of sun the end of Feb. Enjoy your stay and the train trip! Thanks, Lois!! We plan on a fun trip! And, David, it's me…your cousin Marilyn!! !